"We have got tests starting this summer and the flight tests next summer," said Jeff Stanley, the Defense Department's deputy assistant secretary for science, technology and engineering. 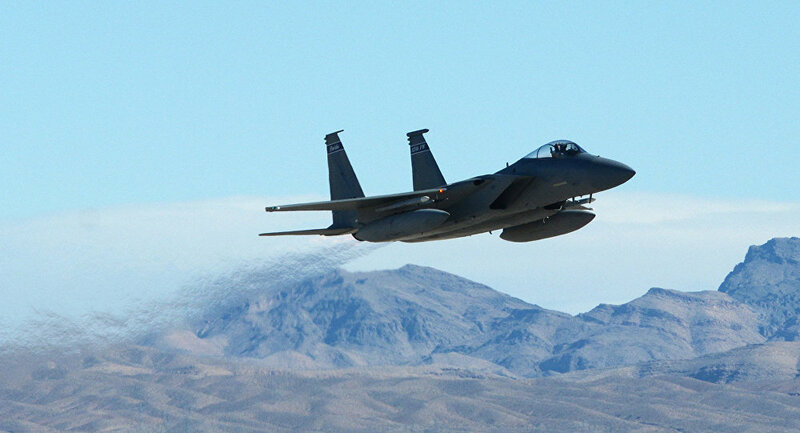 The Self-Protect High Energy Laser Demonstrator (SHiELD) program is designed to make the Air Force's F-15C, F-15E and F-16 aircraft more survivable. The laser weapon pods are unlikely to be mounted on the F-35 fleet, however, since the pods could interfere with the plane's stealth features; B-2s and F-22s are unlikely to have the lasers pods installed for the same reason. SHiELD is made up of three components: the technology that points the laser at targets, a pod to house and cool the laser and the laser itself. Northrop Grumman, Boeing and Lockheed Martin are tasked with developing each subsystem of SHiELD, respectively. The test device has about 50 kilowatts of power. "There are still some technical challenges that we have to overcome — mainly size, weight, power," Stanley told AFP. The SHiELD program is expected to be completed by 2021. The US Navy is also working to arm a warship with a 60 to 150 kilowatt beam within the next two years, Sputnik News reported March 3.